I’ve been dreading this all week. Ever since Aubrey Huff’s implosion on the field (Saturday) and off the field (starting Sunday), most fans have known that trouble is on the way. Huff has had two tough seasons since being one of the unlikely heroes of the 2010 World Series Champion San Francisco Giants. His 2011 was abysmal, something GM Brian Sabean and Manager Bruce Bochy blamed on poor off-season conditioning and lack of commitment. In 2012, his batting average is just .182. On Saturday, in the 9th inning against the New York Mets, 35-year-old Huff played second base — perhaps for the first time in his professional career. On a crucial play in the tied game, he failed to cover the bag. San Francisco fans know all about it, so there’s not much I can add here. We lost. On Sunday Huff was given a day off. On Monday, he was a no show against the Mets. We were told he informed Bruce Bochy via text message that he was dealing with a family emergency. On Tuesday, he again did not join the team. Uh oh. Twitter was remarkably, uncharacteristically restrained. The coincidence of his absence following a huge career blooper, and heavy public criticism, was evident to all. But no one really wrote about it. 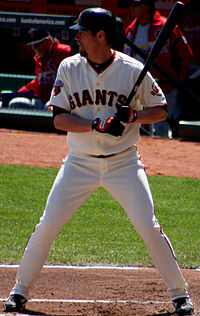 What if there really WAS a family catastrophe, and we wrongly accused Aubrey Huff of simply taking a dive to save face? Most Giants fans know Aubrey Huff’s personal story. He was raised by a single Mom after his father’s tragic death when Aubrey was just seven years old. Oh God, was his Mom ill? Or one of his young sons? Now, I guess, we have our answer. Aubrey Huff is reportedly suffering from Anxiety Disorder, and has been put on the 15-day disabled list. Are career pressures at the root of this anxiety, or the retirement of fellow Giant and BFF Pat Burrell… or something else? Is it even something the public should be debating? Shortly after the announcement of Huff’s placement on the DL, information surfaced that his wife Baubi filed for divorce earlier this year, leading to much debate; Did columnists who reported this news cross a line, given that divorce filings are public information in Florida? If a professional athlete implodes, is the media not entitled to report on what may have caused it? You know what? For once, I am not sure. I don’t feel ENTITLED to know about Aubrey Huff’s personal life, but at the same time… it’s not like I dug through his trashcan to get the information. Truth is, as a fan I’m a pragmatist who wonders… So does this mean Belt will play first on Thursday? At the same time, I feel sincere sadness for the Huff family. Aubrey purportedly suffers from a devastating disorder that afflicts approximately 18% of Americans. He and his wife are splitting up, something far too many families endure in this day and age. Plus he’s had a couple of really embarrassing professional face plants recently. While most of us can identify with some – if not all – of these hardships, we get to suffer through them in relative obscurity. We crawl off into a corner and lick our wounds for a while but – with luck, and thanks to the support and encouragement of our friends, colleagues and family — we emerge feeling a little stronger. My hope is that the media, the team, and my fellow San Francisco Giants fans continue to treat Aubrey Huff’s situation with the sensitivity and empathy it deserves. So far, I’m proud of all of us.